It’s Thanksgiving this week, a time to be thankful for all the special things in your life. Whether you’re headed to grandma’s house for a traditional family feast, or getting together with friends for a Friendsgiving this holiday, the right cocktail can be the perfect addition to any table. Here are 10 Thanksgiving-themed cocktails that will pair perfectly with that turkey and stuffing, and ensure you’re everyone’s favorite dinner guest for bringing them. Even more popular than Jenny, and she brought garlic mashed potatoes. Directions: Add ingredients to an ice filled shaker. Shake and strain into a martini glass. Garnish with whipped cream. Directions: Pour ingredients into a cocktail shaker filled with ice. Stir well and strain into a martini glass. Garnish with mint dusted in edible gold. Directions: Muddle the apple and rosemary in the bottom of a glass. Add Cointreau and lime juice with ice and top with club soda. Stir briefly. Garnish with a sprig of rosemary and a slice of apple. Directions: Combine ingredients in a shaker with ice and shake vigorously. Strain into a highball glass over fresh ice. Garnish with a cranberry skewer. Directions: Combine ingredients into a flute. Lightly stir and garnish with a thin apple slice. Directions: Add all ingredients into an ice-filled shaker. Shake and strain into a glass. 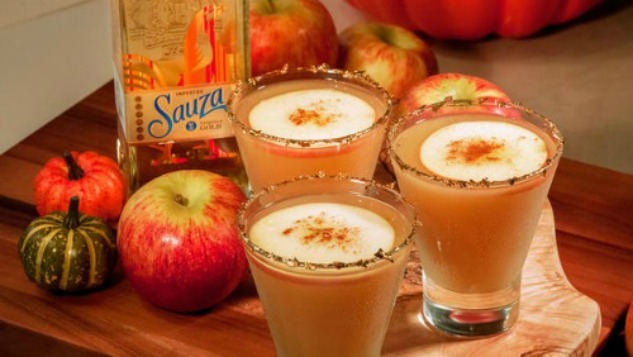 Garnish with an apple slice and cinnamon. Enjoy! *This can also be made pitcher-style for communal drinking. Directions: Add all ingredients except cinnamon to a cocktail tin and shake until you feel the mixture foaming. Add ice to the tin and shake hard for 10-15 seconds. Double-strain into a chilled cocktail glass, sprinkle with cinnamon, and serve. Directions: Combine all ingredients in a shaker. Shake well with ice. Strain into a cocktail glass. Garnish with a cinnamon stick. Directions: Chill all ingredients at least two hours before serving. Fill with glass sparkling wine. Directions: Combine ingredients in a shaker and shake with ice. Strain into a glass over ice and garnish with fresh raspberries.